The below table illustrates my race results and includes PB's (Personnel Bests) as shown in hours & minutes. 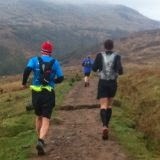 The Hoka Highland Fling is a 53 mile ultra-marathon along the West Highland Way starting at Milngavie and finishing in Tyndrum Scotland. The route follows the (West Highland Way) long distance path and takes in the splendour of Loch Lomond and the Trossachs National Park. My watch had lost its satellite signal on a few occasions, hence not displaying the entire race. (Bein Glas Farm) Check Point at 40.9 miles. After quickly devouring a scotch egg and drinking a cup of strong coffee, the three Omega's were off racing the final leg together. We crossed the finishing line with a traditional TEAM WLAC (We Love A Challenge) sprint finish. After receiving our medals we quickly performed the BURPEES exercise, which is a TEAM WLAC ritual. I was astonished to find how fit and fresh I still felt after running for over 13 hours. I put this down to finally tuned and executed training & nutritional plan. TEAM WLAC Burpees challenge straight after crossing the finishing line, performed by Hamish, Allan & Me. 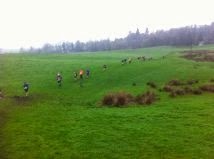 Video taken by Jenni C.
The Howarth Hobble is a 32 mile cross country race that starts and finishes in the village of Howarth in West Yorkshire. The course can be quite daunting, all due to the variance in terrain and cold weather conditions making the under footing treacherous. With each foot being carefully placed down to ensure maximum contact and grip between the sole of each shoe and the underlying surface. My winter training had proven difficult to maintain due to a change in my employment and spending weeks away from home on business. Although, where ever I travelled so did my running kit including my headtorch and Garmin watch. Most nights after work, I would rush back to my accommodation, jump into my running kit and hit the streets. On many occasions the weather would be poor with blustery showers and with temperatures varying between plus 2*C to negative and below. However, I had made a strong commitment by registering myself to compete in a series of 2014 SUMS Ultramarathons (Scottish Ultramarthon Series) and I had PB's ( Personal Bests) to achieve. Therefore, self discipline and pure endurance comes into play. Three days before the race, I had developed a very heavy head cold which was starting to cause an infection within my chest. The demons had started I thought to myself !, trying to prevent me from racing. I had also made a commitment to my race colleagues, by offering transport and companionship during the race. I was never going to surrender to those demons !. A famous quotation that sticks in my mind - (endurance men and women are made of metal and NOT wood) !!!. 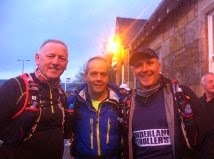 We left the North East of England at 4am on the morning of the race and travelled down to Howarth. Where we registered, got our race numbers and joked with friends before starting the race. 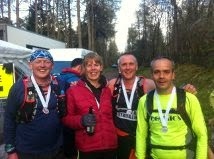 My training buddy Jason who was also competing and this was his first Ultramarathon. During the race as the cold air took hold of the virus, my performance was starting to dwindle. I took the decision to cover my mouth and nose with my bandana to prevent the cold air from worsening my condition. Surprisingly, I had completed the 32 mile race and crossed the finishing line with a 10 minute PB compared to last years performance ! 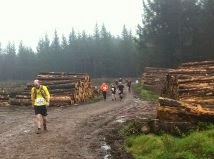 Jason had gracefully completed his first Ultramarthon and in great style, Well Done Jason !!!! As I love a challenge !!!! After reaching the summit of Stoodley Pike at 20 miles, I stopped briefly and performed a series of Burpee exercises , before carrying on with the race heading down towards the village of Hebden Bridge. Video clip of me performing the Burpee exercise at mile 20 of the race. Some where on the course ???? At the finish line with the race done and dusted for another year !!!!. 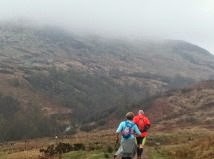 Ultramarathon No2 - Coming Soon !!!!! Facebook "We Love A Challenge"